As you leave Delhi’s borders via the NH-1 and head towards Chandigarh, about 70 km away from Connaught Place is the small, bustling town of Samalkha. Located in Haryana’s Panipat district, it is famous for grain, jaggery and wood markets. However, as you head deeper inside this industrial town, haunting stories of child rights violations begin to emerge. It is the duty of our organisation Child Rights and You (CRY) to restore children’s rights in an area. 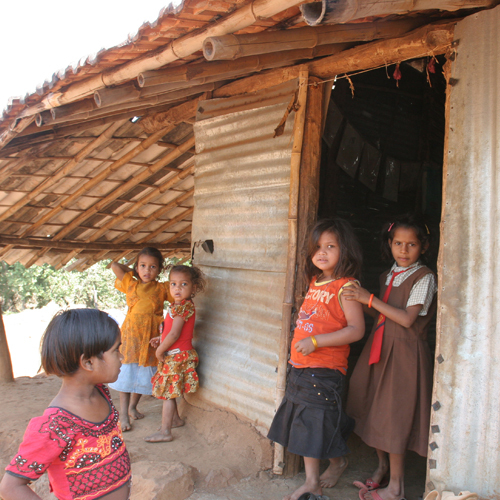 CRY’s intervention area in Samalkha covers 19 Dalit-dominated hamlets under five villages. The Dalit communities here are almost absolutely marginalised and excluded. Child rights violations are rampant in all Dalit hamlets, and Dalits are being denied most democratic rights due to the strong socio-economic-political status of the Gujjars in the area. The children in the families living there are vulnerable to discrimination, exploitation and violence simply because of the caste into which they were born. The caste system relegates Dalits, formerly known as ‘untouchables’, to a lifetime of segregation and abuse. Caste-based divisions dominate in housing and education, in and general social interaction. There is discrimination at every level; the socio-economic condition of the Dalit community is deplorable. The problem of land is central to the impoverished Dalit community. Dalits are prevented from possessing land – even that which has been set aside for them by the government. It is important to realise that land is not just a primary means of production, but also gives the holder economic security, social status and identity. Illiteracy and school drop-out rates among Dalits are very high due to a number of social and physical factors. The illiteracy rate for Samalkha’s Dalit children is also generally higher compared to other children. Discriminatory practices exercised by teachers against these Dalit children include corporal punishment, denial of access to school water and indirect discrimination, such as neglect, repeated blaming, and labelling of Dalit students as weak performers, exclusion from the Mid-Day Meal Scheme etc., lead to social exclusion of Dalit students in school in the area. The health and nutritional status of Dalit children in an intervention area is one of CRY’s major concerns; their effect is directly visible when it comes to early pregnancy, infant deaths, child deaths, maternal deaths and still births. Data from our baseline survey shows an increasing number of infant and child deaths in our intervention area. The disparity in access to resources leads to disparity in exposure to the risk of disease, leading to disparity in disease burdens. There is a very clear indication from our experience in the area that the health status of children and women is very closely related to their social and economic status. More attention needs to be focused on the health of women, which would also help improve not only the health of the child but the whole population. This is the voice of a young Dalit girl currently living in Manana village in Samalkha. Being discriminated against is a more serious problem for a Dalit girl child. Caste-based discrimination makes the Dalit girl more visible to the eyes of the perpetrators and, simultaneously, more invisible to the eyes of the protectors. In Manana village, the liquor shop is located immediately outside the Dalit basti and is unavoidable on the route to and from the fields. Dalit girls going to or returning from the fields have no other option but to walk by the shop, where men leer at them and make suggestive remarks. Young non-Dalit men and boys who enter the basti to drink also bother the girls. There should be a comprehensive approach to counter these problems, it is essential to recognise that the Dalit identity heightens the vulnerability to harassment, abuse and neglect. Constant efforts through awareness generation and capacity building about their rights to bring equal opportunity and social justice to the Dalit children in Samalkha will help them in overcoming the vicious cycle of caste and cultural barrier. Tell DALITS to take their Caste share of land from India and go build their own nation.